There is a place for robotics and that is where building a dedicated mechanism to place a part becomes either too expensive or the task in hand is variable. Robots play an important roll as they can be re programmed to perform another operation either by “teaching” or by a pre programmed recipe. Our robots “SIASUN” can do both. Graham says, when we talk about robotics most people think of some machine with flashing lights & antenna resembling the human form. Engineers who are closer to understanding may think of a welding robot in an automotive plant, however this is very far removed from the truth. Billions have been spent in R&D work around the world to mimic something that may have 5% capability of a human and is likely to do it slower than a trained operator, I sight British woman working in the ammunitions factories during world war II. During that time because of the need, many ingenious mechanical devices were conceived, I am talking about manufacturing say detonator caps at 1000/min on a single machine. This cannot be done one at a time with "robotics", PLC's or PC integrated systems. The fact is most tasks to be performed in manufacturing today are repetitive & high volume. A machine as simple as drilling one hole in a component automatically is in fact a robot, the machine can be doing the task remotely without aid from an operator. Where today's sophisticated PLC's, SCADA packages and sensors play a role is in monitoring, control of events & data capture from a high speed machine. Here is an example: one would not use a PLC to drive the ram of a press doing say 200 strokes/min via a hydraulic or pneumatic cylinder, neither would you use it to operate the clamps & feed cylinder of a strip feeder for the press. You may use the PLC however to monitor blank & scrap removal, no hole sensor & so on. AP DESIGN does use the latest technology & invents its own technology where none exists. It is the way a system is put together rather than spending capital on equipment that can only do one task at a time. A CNC machining centre is a good example here, a part with say 8 holes, some of them tapped & faces machined is loaded onto a machining centre. 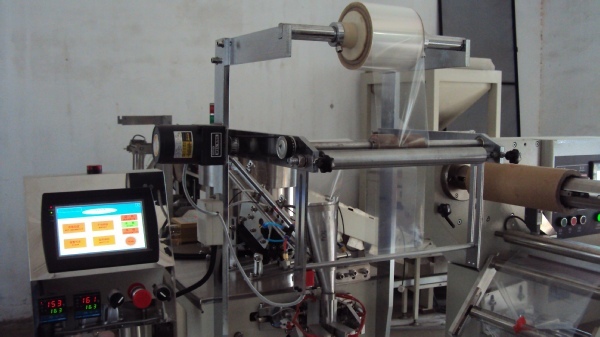 The machine is quick using modern servo drives, it can be easily programmed to perform another task but it can do only one operation at a time, at best two. Now put the same job on a purpose built machine with a rotary index table some auto drilling & tapping heads, a machining head or two and you have a machine that performs all operations at the same time. That means your production rate can increase over & above the machining centre by the number of operations there are. This of course is only practical where there are long runs of components. Such a machine would be designed using a PLC to operate the sequence of events with interactive display (HMI)for the operator/technician. The development of the PLC was the most significant single item that enabled AP DESIGN to improve the cost effectiveness of its machinery, this industry along with electronic/logic devices has made huge strides in the past 20 years. Your machine these days will talk to you via a screen & tell you what is wrong or give you statistical data, even speech may used. Interactive screens may be programmed to perform any number of tasks by a touch. Equipment in the field has had to keep up with this technology and some advanced sensing & monitoring equipment is on the market today. Only 25 years ago when AP DESIGN started using PLC equipment they had to manufacture their own specialised sensors & provide & integrate their own screen displays. What has happened with robotics technology development is a series of robotic devices are now available to the machine builder. Grippers, wrist movements, take out devices for plastics injection moulding, & vision recognition systems plus many more useful tools. At the end of the day most of these devices are mechanically based & powered by fluid or servo drives. Other peripheral items that help the machine builder are various forms of linear ball bearings & slide ways, which have also advanced in recent years. So, what does AP DESIGN do & what can they offer? A.P. DESIGN offers a complete service from design & drawing to final manufacture & commissioning. All disciplines are covered in house. Electronic development, software systems. Pneumatic control systems, Hydraulic systems, PLC control systems & general pneumatic sales. Machining capacities: turning up to 900mm dia X 3500mm long, milling & boring 2750mm X 900mm X 500mm up to 2500kg on the bed plus all the toolroom machinery you would expect to find. Other than purpose built equipment A.P. DESIGN offers their standard range of equipment summarised as follows: Microprocessors for cut to length applications & fluid dispensing. 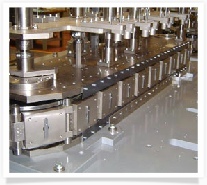 Tube cutting machines operating on the "snap cut" principle, cut to length lines. Decoilers up to 30ton capacity. 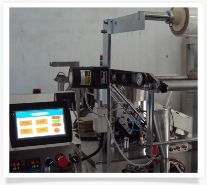 Electronic roll feed equipment & pneumatic strip feeders type "Rapid Air". Auto feed drilling & tapping heads, Index tables & CNC rotary tables. Transfer lines. AP "Mini leveller" for press feed & general coiled material straightening. 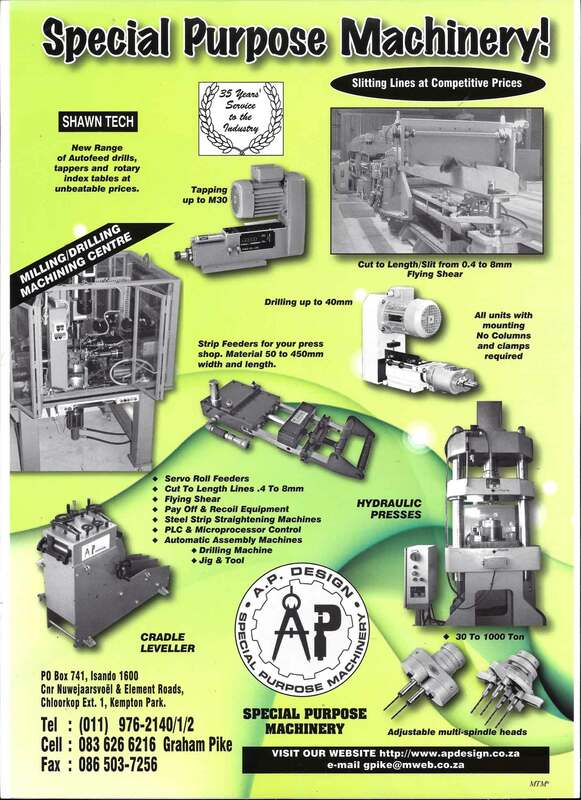 AP Design has acquired the sole agency for Shawn Tech equipment, in brief this comprises a range of auto feed drilling & tapping machines & rotary index tables. The equipment is highly durable & cost effective, please ask for a demonstration click here. AP Design can supply units only or a complete purpose built machine to your requirements. The toolroom is highly capable in design & manufacture of press blank & form tools, The electronics department specialises PLC software, PC based data capture & logging, advanced drive technology. AP staff number 15,each is specialising in a particular discipline.